After hearing news of Carter’s cancer diagnosis, I took it upon myself to brush up on this single-term president and beloved writer. 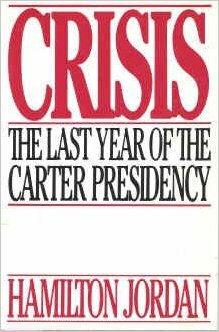 As my family library is filled to the brim with old-books from the 80’s, I was psyched to find Hamilton Jordan’s book, Crisis: The Last Year of the Carter Presidency. This wasn’t exactly what I’d been hoping to read, but it ended up being a really interesting recap of the administration’s dealings with the Iranian hostage crisis. 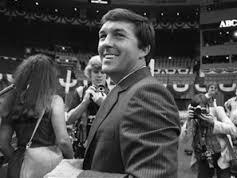 For those who enjoyed “Argo,” or want a more sympathetic perspective on Carter’s political demise, Jordan’s book is a great foray into better understanding our 39th President. Jordan, himself, is a controversial character, often referred to as the “enfant terrible” of Carter’s staff. His agonizing efforts to free the Iranians before the election, and then before Reagan’s inauguration, are difficult to read. 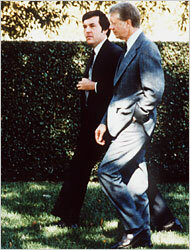 It almost seems like Carter, Jordan and the rest of the administration existed on a never-ending treadmill that year– walking constantly, but never moving forward.